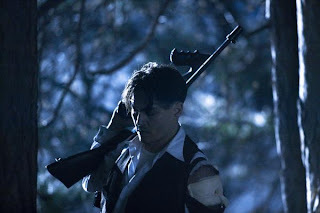 It's the 1930s and when we meet the film's anti-hero, John Dillinger (Johnny Depp), the charismatic bank robber extraordinaire, he's already public enemy #1 and a household name in America. The opening sequence establishes Dillinger's forthright attitude and skills with a Tommy Gun, as the moment he sets foot in the prison, he breaks out in a hail of bullets and is back robbing banks. The man on his tail, assigned by J. Edgar Hoover (a laughable impression by Billy Crudup), is another intensely focused man of action, Melvin Purvis (Christian Bale), who becomes the Al Pacino to Johnny Depp's Robert De Niro. It's a cat and mouse chase from beginning to end with many bank robberies in between. Dillinger's relationship with his main squeeze Billie Frechette (Marion Cotillard) provides the film its heart, and in the final moments that connection of respect between the cops and robbers Mann's so eloquently explored in Heat. The elephant in the room throughout the entire film is Mann's awful visual design. Under the high-speed movements and the rapid flashing of gunfire the high definition image breaks up revealing a dreaded "video" look. Mann's lighting is god-awful as well, in what appears to be an extreme minimalist philosophy the character's faces are often in complete darkness — a curiously uncinematic treatment from a man often accused of over stylization. It's a shame because the film leans so heavily on the cinematic legacy of the genre, from the characters' self-awareness of their actions to the importance of cinema and public opinion of this story. Dillinger acts like a movie gangster; his courtship of Billie has the same "me take" attitude of Jimmy Cagney. Women are objects for the taking, and vulnerable to the allure of danger. In the film's best scene Dillinger even sits down to watch a gangster film in the cinema, as if watching his life lived out on the big screen. It's all part of the Hollywood romanticism of crime, a world Mann unabashedly lives and breathes in. Mann's imposition of non-style to a genre that is entirely based on style is a contradiction that threatens to drown the film. Thankfully, it doesn't. The film gains a steady momentum increasing in intensity all the way until the end. There are mondo gunfights, and masculine tough guy bravado, satisfying all those playful boyhood urges. If only those gunfights were lit properly or perhaps shot with today's further advanced digital cinematography, then perhaps Mann would have another crime masterpiece. I feel like movies from decades ago are just like something we have today (or even better) but just lack of the modern technology.